As part of ADA’s current Operation, Maintenance, Repair, Replacement, and Rehabilitation (OMRR&R) contract with the SFWMD, the ADA design team worked on designing a steel framing structure with a mobile 7.5-ton hoist to lift manatee protection barriers out of the water for cleaning vegetative debris that occasionally impedes flow. Catwalks were also proposed to allow for staff to access the grates once lifted. 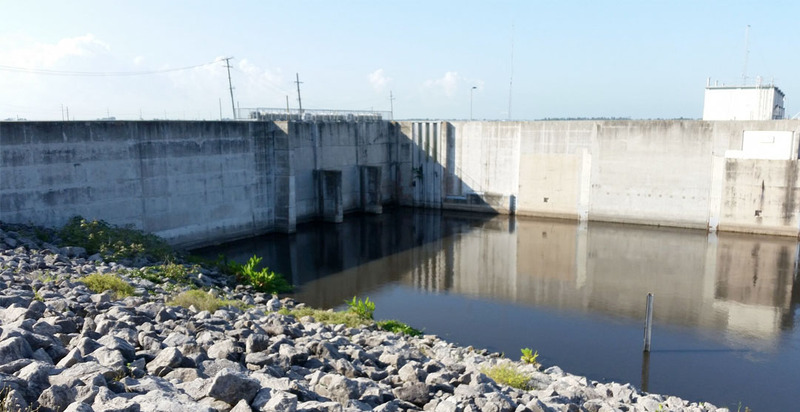 The S-351 and S-354 spillway structures are adjacent to the S-2 and S-3 pump stations, respectively, at the south portion of Lake Okeechobee along the rim canal. The two facilities were built and are owned by the Army Corps of Engineers (ACOE) but are operated and maintained by SFWMD. The previous method for cleaning the debris off the grates included mobilizing a crane and boat with crew members for cleaning. This project provided a more permanent solution. ADA’s role included the structural, mechanical, and electrical design. Three preliminary alternatives were introduced to SFWMD staff to agree on a concept before getting too far into detailed design. The chosen alternative had the most functional and least maintenance characteristics. A lot of coordination was required with hoist manufacturers to ensure the hoist was constructible and “off the shelf”. Design capacity was 15,000 lbs. Load limiters and slack detectors were included in the design specifications in the case of the grates getting stuck in the framing supports. The steel structure was proposed to be mounted on the operating deck using adhesive anchors and lateral bracing. 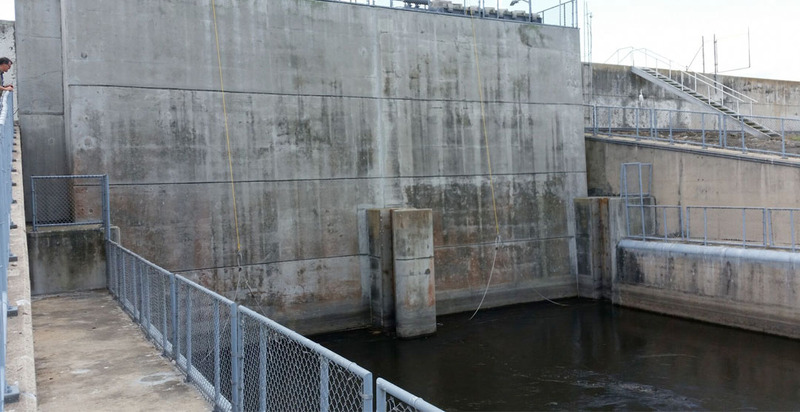 The manatee grates are placed in the same slots as the dewatering logs, so coordination was required to ensure no conflict with overhead crane operation in the case of dewatering for maintenance. The existing electrical system was utilized for operating the movable hoist. 3-phase, 480 volt. An existing hydraulic system exists on the operating platform, but the logistics of altering that system for use on the hoist proved unfeasible. This project is currently advertised for bid with construction slated for September 2017.